The technology of creating a motion mathematical model of an industrial robot manipulator has been proposed. 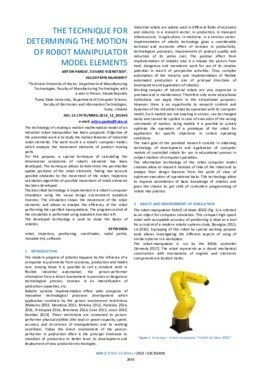 Objective of the presented work is to study the motion features of industrial robot elements. The work result is a robot's computer model, which analyzes the movement elements of product moving parts. For this purpose, a special technique of calculating the dimensional constraints of robot's elements has been developed. The technique allows to determine the permissible spatial positions of the robot elements. Taking into account possible obstacles to the movement of the robot, trajectory calculation algorithm of possible movement of robot elements has been developed. The described technology is implemented in a robot's computer simulation using the visual design environment Autodesk Inventor. The simulation shows the movement of the robot elements, and allows to analyze the efficiency of the robot performing the specified manipulations. The program control of the simulation is performed using Autodesk Inventor API. The developed technology is used to study the basics of robotics.